Danielis being carried on a litter by eunuchs from the Chronicle of Ioannis Skylitzis, mid-13th century, Madrid,Biblioteca Nacional. Danielis (9th century AD) was a widowed Byzantine noblewoman from Patras. According to the written tradition (continuing in the tradition of Theophanes) she owned a significant part of the Peloponnese as well as a flourishing carpet and textile industry. Danielis became acquainted with the future emperor Basil I the Macedonian in a visit he made in Patras when he was still an attendant of the imperial delegate. Danielis offered Basil lavish gifts and land property which proved useful in his ascent to the Byzantine throne. 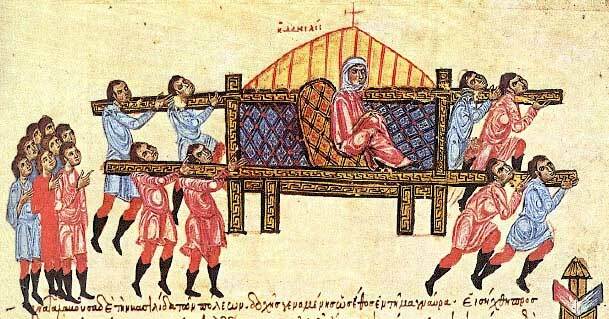 She also travelled to Constantinople followed by her numerous servants in order to visit Basil as an emperor, in what the chronicles describe as an extravagant journey. Her loyalty to the throne was rewarded with the title of King Mother (Basilomitor). She outlived Basil I and appointed Basil's son Leo VI the Wise as her heir. Leo released 3,000 of her slaves and sent them to settle in Southern Italy. Runciman, Steven (1966). Byzantine Civilisation, Edward Arnold (Publishers) Ltd..